This article is about the human use of the molluscs in the genus Haliotis. See that page for scientific information about this genus, and links to information about individual species. For other uses, see Abalone (disambiguation). "Abelone" redirects here. For the wine grape that is also known as Abelone, see Chasselas. Abalone ( i/ˈæbəloʊniː/ or /ˌæbəˈloʊniː/; via Spanish abulón, from the Rumsen language aulón) is a common name for any of a group of small to very large sea snails, marine gastropod molluscs in the family Haliotidae. Other common names are ear shells, sea ears, and muttonfish or muttonshells in Australia, ormer in Great Britain, perlemoen in South Africa, and pāua in New Zealand. Abalone are marine snails. Their taxonomy puts them in the family Haliotidae which contains only one genus, Haliotis, which once contained six subgenera. These subgenera have become alternate representations of Haliotis. The number of species recognized worldwide ranges between 30 and 130 with over 230 species-level taxa described. The most comprehensive treatment of the family considers 56 species valid, with 18 additional subspecies. A mantle cleft in the shell impresses a groove in the shell, in which are the row of holes characteristic of the genus. These holes are respiratory apertures for venting water from the gills and for releasing sperm and eggs into the water column. They make up what is known as the selenizone which forms as the shell grows. This series of 8 to 38 holes is near the anterior margin. Only a small number are generally open. The older holes are gradually sealed up as the shell grows and new holes form. Each species has a typical number of open holes, between four and ten, in the selenizone. 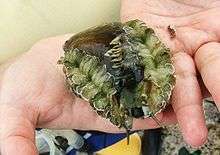 An abalone has no operculum. The aperture of the shell is very wide and nacreous. The exterior of the shell is striated and dull. The color of the shell is very variable from species to species which may reflect the animal's diet. The iridescent nacre that lines the inside of the shell varies in color from silvery white, to pink, red and green-red to deep blue, green to purple. The animal shows fimbriated head-lobes. The side-lobes are also fimbriated and cirrated. The rounded foot is very large. The radula has small median teeth, and the lateral teeth are single and beam-like. There are about 70 uncini, with denticulated hooks, the first four very large. The soft body is coiled around the columellar muscle, and its insertion, instead of being on the columella, is on the middle of the inner wall of the shell. The gills are symmetrical and both well developed. These snails cling solidly with their broad, muscular foot to rocky surfaces at sublittoral depths, although some species such as Haliotis cracherodii used to be common in the intertidal zone. Abalones reach maturity at a relatively small size. Their fecundity is high and increases with their size (from 10,000 to 11 million eggs at a time). The spermatozoa are filiform and pointed at one end, and the anterior end is a rounded head. The larvae are lecithotrophic. The adults are herbivorous and feed with their rhipidoglossan radula on macroalgae, preferring red or brown algae. Sizes vary from 20 millimetres (0.79 in) (Haliotis pulcherrima) to 200 millimetres (7.9 in) while Haliotis rufescens is the largest of the genus at 12 inches (30 cm). Abalones are herbivorous on hard substrata. By weight, approximately one-third of the animal is edible meat, one-third is offal, and one-third is shell. Abalones are subject to various diseases. The Victorian Department of Primary Industries said in 2007 that ganglioneuritis killed up to 90% of stock in affected regions. Abalone are also severe hemophiliacs as their fluids will not clot in the case of a laceration or puncture wound. 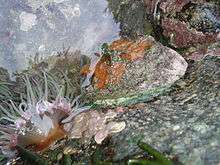 Members of the Spionidae family of the polychaetes are known as pests of abalone. 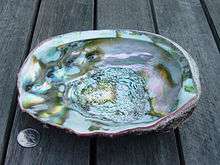 The meat (foot muscle) of abalone is used for food, and the shells of abalone are used as decorative items and as a source of mother of pearl for jewelry, buttons, buckles, and inlay. Abalone shells have been found in archaeological sites around the world, ranging from 75,000-year-old deposits at Blombos Cave in South Africa to historic Chinese abalone middens on California's Northern Channel Islands. On the Channel Islands, where abalones were harvested by Native Americans for at least 12,000 years, the size of red abalone shells found in middens declines significantly after about 4000 years ago, probably due to human predation. Worldwide, abalone pearls have also been collected for centuries. After trials in 2012, a commercial "sea ranch" was set up in Flinders Bay, Western Australia to raise abalone. The ranch is based on an artificial reef made up of 5000 (As of April 2016) separate concrete units called abitats (abalone habitats). The 900 kilograms (2,000 lb) abitats can host 400 abalone each. The reef is seeded with young abalone from an onshore hatchery. The abalone feed on seaweed that has grown naturally on the abitats; with the ecosystem enrichment of the bay also resulting in growing numbers of dhufish, pink snapper, wrasse, Samson fish among other species. Brad Adams, from the company, has emphasised the similarity to wild abalone and the difference from shore based aquaculture. "We're not aquaculture, we're ranching, because once they're in the water they look after themselves." Abalones have long been a valuable food source for humans in every area of the world where a species is abundant. The meat of this mollusc is considered a delicacy in certain parts of Latin America (especially Chile), France, New Zealand, Southeast Asia, and East Asia (especially in China, Vietnam, Japan, and Korea). In Chinese-speaking regions, abalone is commonly known as bao yu, and sometimes forms part of a Chinese banquet. In the same way as shark fin soup or bird's nest soup, abalone is considered a luxury item, and is traditionally reserved for special occasions such as weddings and other celebrations. However, the availability of commercially farmed abalone has allowed more common consumption of this once rare delicacy. Sport harvesting of red abalone is permitted with a California fishing license and an abalone stamp card. In 2008, the abalone card also came with a set of 24 tags. This was reduced to 18 abalone per year in 2014, only nine of which may be taken south of Mendocino County. Legal-size abalone must be tagged immediately. Abalone may only be taken using breath-hold techniques or shorepicking; scuba diving for abalone is strictly prohibited. Taking of abalone is not permitted south of the mouth of the San Francisco Bay. A size minimum of 7 in (180 mm) measured across the shell is in place. A person may be in possession of only three abalone at any given time. Abalone may only be taken from April to November, not including July. Transportation of abalone may only legally occur while the abalone is still attached in the shell. Sale of sport-obtained abalone is illegal, including the shell. Only red abalone may be taken, as black, white, pink, flat, green, and pinto abalone are protected by law. An extensive global black market exists in collecting and exporting abalone meat. This can be a particularly awkward problem where the right to harvest pāua can be granted legally under Māori customary rights. When such permits to harvest are abused, it is frequently difficult to police. The limit is strictly enforced by roving Ministry for Primary Industries fishery officers with the backing of the New Zealand Police. Poaching is a major industry in New Zealand with many thousands being taken illegally, often undersized. Convictions have resulted in seizure of diving gear, boats, and motor vehicles and fines and in rare cases, imprisonment. The Ministry of Fisheries expects in the year 2004/05, nearly 1,000 tons of pāua will be poached, with 75% of that being undersized. The largest abalone in South Africa, Haliotis midae, occurs along roughly two-thirds of the country’s coastline. Abalone-diving has been a recreational activity for many years, but stocks are currently being threatened by illegal commercial harvesting. In South Africa, all persons harvesting this shellfish need permits that are issued annually, and no abalone may be harvested using scuba gear. The highly iridescent inner nacre layer of the shell of abalone has traditionally been used as a decorative item, in jewelry, buttons, and as inlay in furniture and in musical instruments such as guitars, etc. Abalones have been identified as one of the many classes of organism threatened with extinction due to overfishing, acidification of oceans from anthropogenic carbon dioxide, as reduced pH erodes their shells. It is predicted that abalones will become extinct in the wild within 200 years at current rates of carbon dioxide production. 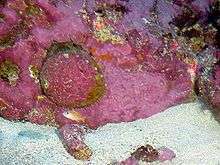 Currently the white, pink, and green abalone are on the federal endangered species list, and possible restoration sites have been proposed for the San Clemente Island and Santa Barbara Island areas. The possibility of farming abalone to be reintroduced into the wild has also been proposed, with these abalone having special tags to help track the population. ↑ "El marisco más exclusivo del mundo se cría en Galicia". El Pais. PRISA. 28 July 2016. Retrieved 28 July 2016. ↑ "Information Memorandum, 2013 Ranching of Greenlip Abalone, Flinders Bay – Western Australia" (PDF). Ocean Grown Abalone. Ocean Grown Abalone. Retrieved 23 April 2016. ↑ Fitzgerald, Bridget (28 August 2014). "First wild abalone farm in Australia built on artificial reef". Australian Broadcasting Corporation Rural. Australian Broadcasting Corporation. Retrieved 23 April 2016. It's the same as the wild core product except we've got the aquaculture advantage which is consistency of supply. ↑ Murphy, Sean (23 April 2016). "Abalone grown in world-first sea ranch in WA 'as good as wild catch'". Australian Broadcasting Corporation News. Australian Broadcasting Corporation. Retrieved 23 April 2016. So to drive future growth I really believe sea ranching is a great opportunity going forward for some of these coastal communities. ↑ Dubin, Margaret (2008). Tolley, Sara-Larus, ed. Seaweed, Salmon, and Manzanita Cider: A California Indian Feast. Heyday Books. ↑ Plagányi, Éva; Butterworth, Doug; Burgener, Markus (2011-01-01). "Illegal and unreported fishing on abalone—Quantifying the extent using a fully integrated assessment model". Fisheries Research. 107 (1–3): 221–232. doi:10.1016/j.fishres.2010.11.005. ↑ Field, Les (2008). Abalone Tales. Duke University Press. ↑ Rogers-Bennett, Laura; et al. (October 1, 2002). "Using Spatially Explicit Data to Evaluate Marine Protected Areas for Abalone in Southern California". Conservation Biology. 16 (5): 1308–1317. doi:10.1046/j.1523-1739.2002.01002.x. ISSN 0888-8892. ↑ "Abalone: History and Future". www.marinebio.net. Retrieved 2016-05-06. Anon (2014b). "Ormering Tides 2014". visitguernsey.com. State of Guernsey Commerce and Employment. Archived from the original on 16 August 2014. Retrieved 16 August 2014. Anon (11 April 2007). "Six Arrested in Massive Abalone Bust". Mail & Guardian. Archived from the original on 16 August 2014. Retrieved 16 August 2014. Anon (2004). "Submission on Consultation Document on Fisheries Research Services Proposed for 2004/2005 and 2004/08 Statement of Intent Including Output Plan for 2004/5" (PDF). New Zealand Ministry for Primary Industries. Archived from the original on 16 August 2014. Retrieved 16 August 2014. Beesley, P. L.; Ross, G. J. B.; Wells, A. (1998). Mollusca: The Southern Synthesis: An Essential Reference. Melbourne, Australia: CSIRO Publishing. pp. 667–669. ISBN 0-643-05756-0. Byrne, Maria; Ho, Melanie; Wong, Eunice; Soars, Natalie A.; Selvakumaraswamy, Paulina; Shepard-Brennand, Hannah; Sworjanyn, Symon A.; Davis, Andrew R. (7 August 2011). "Unshelled Abalone and Corrupted Urchins; Development of Marine Calcifiers in a Changing Ocean" (PDF). Proceedins of the Royal Society Biological Sciences: Series B. 278: 1–9. ISSN 0962-8452. Retrieved 16 August 2014. Freeman, Kylie A. (June 2001). "Aquaculture and Related Biological Attributes of Abalone Species in Australia - A Review" (PDF). Fisheries Research Report. North Beach, WA, Australia: Department of Fisheries. 128. ISBN 0-7309-8456-7. ISSN 1035-4549. Geiger, Daniel L.; Groves, Lindsey T. (September 1999). "Review of Fossil Abalone (Gastropoda, Vetigastropoda, Haliotidae) with Comparison to Recent Species". Journal of Paleontology. Lawrence, KS: Paleontological Society. 73 (5): 872–885. ISSN 0022-3360. Gofas, Serge; Tran, Bastien; Bouchet, Phillippe (2014). "WoRms Taxon Details: Haliotis Linnaeus, 1758". WoRMS (World Register of Marine Species). Archived from the original on August 16, 2014. Retrieved August 16, 2014. Hoiberg, Dale H., ed. (1993). Encyclopædia Britannica. 1: A-ak Bayes (15th ed.). Chicago, IL: Encyclopædia Britannica, Inc. ISBN 0-85229-961-3. LCCN 2002113989. Jones, Glenn A. (2008). ""Quite the Choicest Protein Dish": The Costs of Consuming Seafood in American Restaurants, 1850-2006". In Starkey, David J.; Holm, Poul; Barnard, Michaela. Oceans Past: Management Insights from the History of Marine Animal Populations. London, UK: Earthscan. ISBN 978-1-84407-527-0. Lin, Albert; Meyers, Marc André (15 January 2005). "Growth and Structure in Abalone Shell". Materials Science and Engineering: A. 390 (1-2): 27–41. doi:10.1016/j.msea.2004.06.072. ISSN 0921-5093. Loosanoff, Victor L. (1997). "Abalone". In Johnston, Bernard. Collier's Encyclopedia. I: A to Ameland (1st ed.). New York, NY: P. F. Collier. State of California (2014). "Title 14, Division 1, Subdivision 1, Chapter 4, Article 1, §29.15 Abalone". Westlaw. Archived from the original on 16 August 2014. Retrieved 16 August 2014. State of California (January 2011). "Special Animals (898 Taxa)" (PDF). State of California: Division of Fish and Game. Archived (PDF) from the original on 22 August 2014. Retrieved 22 August 2014. State of California (2008). "Title 14, Division 1, Subdivision 1, Chapter 4, Article 1, §29.16 Abalone Report Card and Tagging Requirements (FG 2915, See Section 701)". Westlaw. Archived from the original on 16 August 2014. Retrieved 16 August 2014. Tran, Bastien; Bouchet, Phillippe (2009). "WoRMS Taxon Details: Haliotis corrugata oweni Talmadge, 1966". WoRMS: World Register of Marine Species. Archived from the original on 19 August 2014. Retrieved 19 August 2014. Westaway, Cameron; Norriss, Jeff (October 1997). 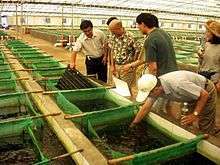 "Abalone Aquaculture in Western Australia" (PDF). Fisheries Management Paper. Fisheries Western Australia. ISSN 0819-4327. "Abalone". Encyclopædia Britannica (11th ed.). 1911. Field, Les (2008). Lomawaima, K. Tsianina, ed. Abalone Tales: Collaborative Explorations of Sovereignty and Identity in Native California. Durham, NC: Duke University Press. ISBN 978-0-8223-4233-5.